As a little girl, I always loved the imaginative (impossible?) treehouse the marooned Swiss Family Robinson designed for themselves. 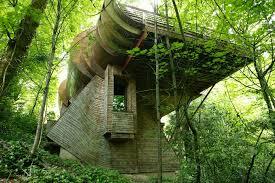 I would love the chance to spend a weekend in a real treehouse. Joanna shares her vacation fantasy: Treehouse Point. They have not one, but two tree-houses on the property, in addition to a main lodge with suites and are located in Issaquah, Washington. For a modern and more permanent take on childhood treehouses, Clara found the Wilkinson Residence by architect Robert Harvey Oshatz. It's located in Portland, Oregon, and is described as "a house that not only became part of the natural landscape but also addressed the flow of music." Neat!